The Simon Says Memory Brain Game is an electronic kit that is as fun to build as it is to play. This game features four LEDs and audio buzzer that beep and blink in a pattern. The player must remember the exact sequence played and repeat it using the four buttons. The game gradually becomes more challenging as play continues. One of four difficulties levels can be chosen at startup. 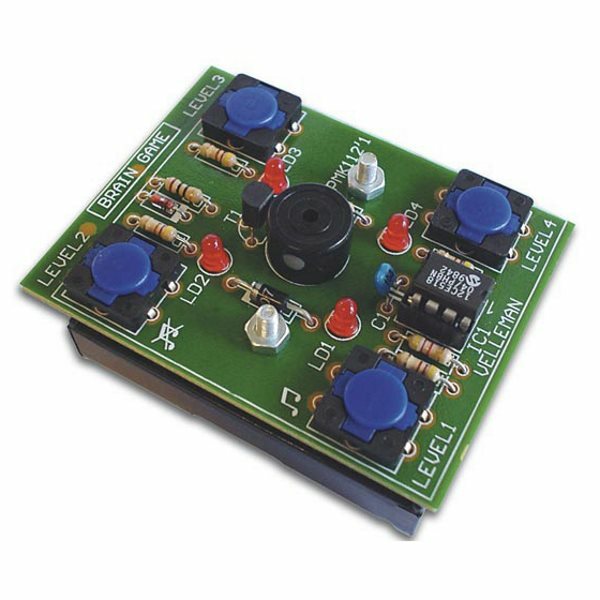 This kit features a preprogrammed microcontroller. Audio feedback can be turned on or off at the push of a button. It is powered by 3 AA batteries and will automatically power off when not in use to conserve power. The Brain Game is an electronic kit that requires basic soldering skills. Three AA batteries are required.